1. Mris ffrances Tyldesley was probably only a child or a very young person at the date of her death. To account for her burial at Leyland we may suppose that she was living with her grandmother, Lady Frances Tyldesley, who at this time resided at Leyland Hall. Lady Tyldesley was the daughter of Ralph Standish, of Standish, Esquire, and the widow of the gallant major-general who fell at Wigan Lane in 1651. 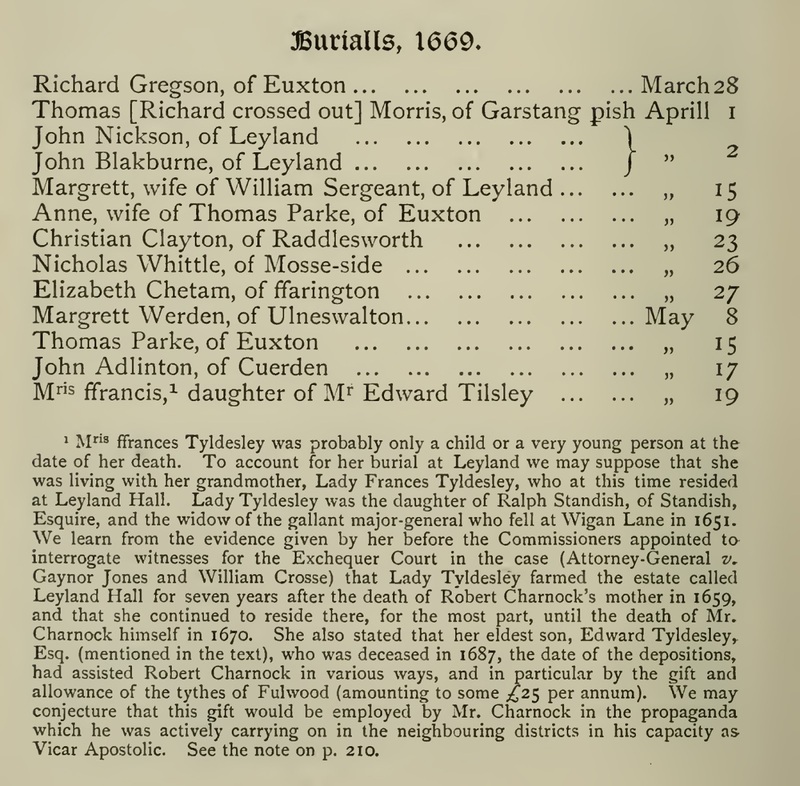 We learn from the evidence given by her before the Commissioners appointed to interrogate witnesses for the Exchequer Court in the case (Attorney-General v. Gaynor Jones and William Crosse) that Lady Tyldesley farmed the estate called Leyland Hall for seven years after the death of Robert Charnock's mother in 1659, and that she continued to reside there, for the most part, until the death of Mr. Charnock himself in 1670. She also stated that her eldest son, Edward Tyldesley, Esq. 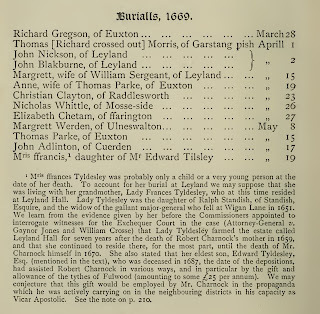 (mentioned in the text), who was deceased in 1687, the date of the depositions, had assisted Robert Charnock in various ways, and in particular by the gift and allowance of the tythes of Fulwood (amounting to some £25 per annum). We may conjecture that this gift would be employed by Mr. Charnock in the propaganda which he was actively carrying on in the neighbouring districts in his capacity as Vicar Apostolic. See the note on p. 210. 1. The Register Book of Christenings, Weddings and Burials within the Parish of Leyland, Walter White, 1890.